I use everything in this tackle category as often as I can. I wish I had time to use it more often. I try to buy and use the best fly fishing tackle available, at a reasonable price. 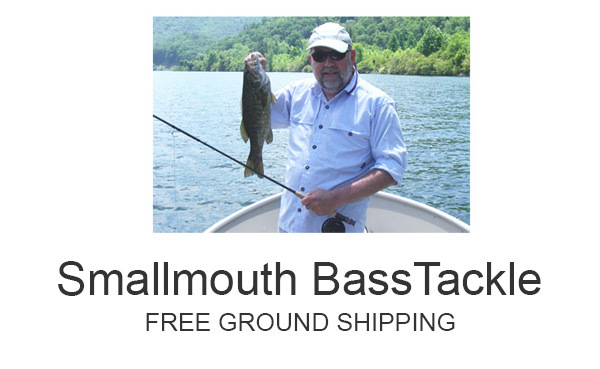 I fly fish for smallmouth bass from boats, canoes and kayaks. If I drop a rod and reel overboard, in deep water, I don’t want it to be expensive gear. It might be gone forever. I choose Temple Fork Rods because, for the money, I think they perform very well. There are many fly rods made that perform well. I choose TFO on a price/performance/value basis. I like Orvis’ mid-priced reels. I think they offer good value and perform well. Again, there are many choices out there. I just chose the Orvis mid-priced, mid-arbor reels to buy and use. I am very happy with them, and ours are several years old. I do love the Rio Smallmouth Bass line. I like the way it casts smallmouth bass flies, and the way it behaves in cool or warm water. I’ve found it doesn’t kink when it is hot or have a great memory when it is cold. It works for me and I like it. I chose to use Orvis leaders and tippet at least 30 years ago. I really can’t remember when. There are many brands and many of our customers use those and swear by them. I just started using Orvis at a point in my life, and I’ve never changed. So, the leaders and tippet you see in this category are both made by Orvis. I use Super Strong when I’m fishing with floating flies. I use Mirage with sinking flies and streamers. So, here is what I use. This is the tackle I recommend for many reasons. Little River Outfitters is a fly shop and mail order company located in Townsend, Tennessee, a gateway to Great Smoky Mountains National Park. We have been family owned since 1994.